Sherrie Scraps with passion: Whimsical Wednesday Blog Hop this Friday!!! 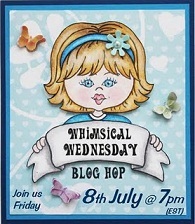 Be sure to mark your calenders for this Fri July 8th at 7pm (EST) for the Whimsical Wednesday Blog Hop . You will get the chance to meet the new Design Team and have a chance to see some amazing projects!!! There will be chances to win lots of blog candy too :) See you on Friday~you won't want to miss this!!! Hi Sherrie, I can't wait to see all the wonderful projects!! I'm a new follower so i will be back:) I hope you can stop by when you get a chance to say hi!